In 2015, we helped the Dike-New Hartford School District with the creation of a new FIRST Robotics Competition team. We aided Team 6164, “DNH Robotics,” in the process of filling out their registration forms, and we helped set them up for a grant to get them started. 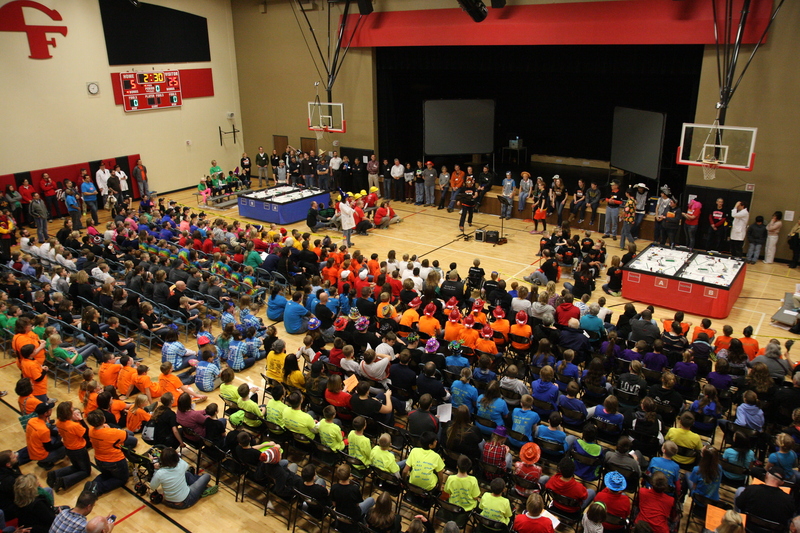 In 2015, we also helped with the creation of a new FIRST Robotics Competition in the neighboring city of neighbor of Waterloo. Team 5837, “Unity4Tech” was aided with an interview that we got them for a grant, as well as a presentation that we gave to interested students and mentors in the area. A mentor that had previously worked with 525 is now working closely with 5837. Waterloo Schools offered STEM classes for their students during the summer. Our team led a workshop at our build site explaining all aspects of FIRST Robotics and gave students hands on opportunities. In November 2016, we demonstrated our robot and helped in a recruitment day for the new Union High School FRC team in LaPorte City. In addition to explaining and driving our robot, we shared our experiences and told them about all of the amazing opportunities that we have gained as a result of participating in FRC. Overall, we worked to help interest students about joining the new Union FRC team. Since 2015, we hosted an official kickoff. It has quickly grown and in 2017, 25 teams attended! Teams can come and pickup their kit of parts in the morning. Then, the afternoon features a series of workshop led by our team. The workshops cover topics including control systems, brainstorming possible design strategies, quickbuild sessions, and what a build session and regional are like. Starting in 2010, we ran a week zero scrimmage. This gives teams the opportunity to experience a regional in a low stress environment. 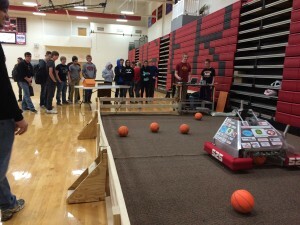 The scrimmage gives teams the chance to tryout their robots on a real field before bag day. Official inspectors are also present to walk teams through a mock inspection. In 2017, we renamed it as the Corn Dog Classic. This scrimmage has grown and in 2017, 17 teams participated! On October 29, 2015 we partnered with our school and an FTC team at our high school to participate in a Food drive fundraiser. We decorated the trunk of a car in orange, black, and green (the Sabre-Hoof Tigers color) and passed out candy to little kids that participated. In order to participate, the kids along with the people decorating a trunk had to donate cans that would go to the North East Iowa Food Bank. On December 12, 2014 we hosted a Toys for Tots fundraiser at our high school. For $2 or a small toy our peers, teachers, and other staff were allowed to drive our 2012 robot to see how many baskets they could make. We kept track of points and a small prize was given to the person with the highest score at the end of each hour and a grand prize to the person with the highest score of the day. Every year our team organizes and hosts an FLL Regional Qualifier. The past couple years it has filled up in only 3 minutes! All team members and mentors volunteer in various positions throughout the day and set up the night before. In addition to volunteering, we sell pizza and pop as a team fundraiser. We also have a demonstration set up in the pits that the FLL teams can stop and see throughout the day. In November 2016, we traveled to the Denver FIRST LEGO League Regional Qualifier in Denver, Iowa. Here we gave a presentation and demonstration of our 2016 robot, Cricket. We explained the opportunities that being on an FRC team offers students. We were pleased to be invited to show our robot at the Marshalltown FIRST LEGO League Regional Qualifier in December 2014. While there we got the chance to interact with teams and even see a few matches! Due to the increase in FLL Jr teams in the Cedar Valley, we have hosted multiple FLL Jr Expos. Every year since 2011, we ran two FLL Jr Expos (one expo in the morning and one expo in the afternoon) at the Cedar Falls Regional Qualifier. We also ran FLL Jr Expos in May 2017 and December 2017. 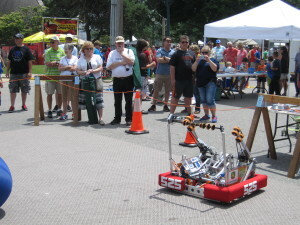 To help promote STEM throughout the state we show our robot at the Iowa State Fair. The Iowa State Fair is also an opportunity for our team members to tell visitors about FIRST and FRC. We travelled to the Iowa State Capitol to talk to legislators and visitors. We demonstrated our robot and talked about the FRC Scale-up program and how it helps FRC teams. 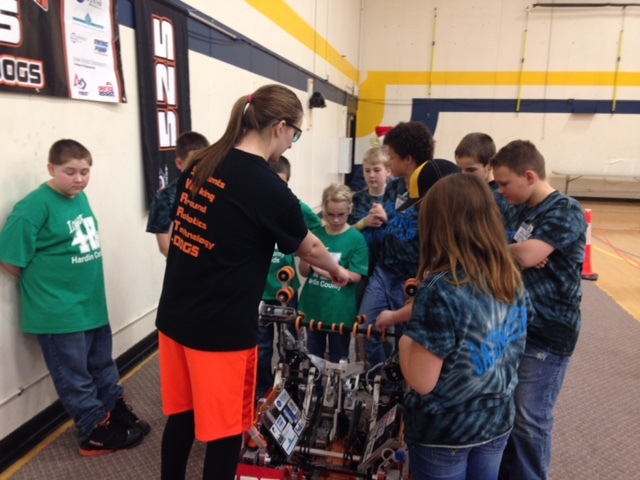 Since 2005, a group of Swartdogs travelled to Ames for the Iowa FLL State Championship. We spent the day talking to people about our team, FRC, and our robot. For the past couple of years, we also gave a presentation at the end of the day during judges deliberation. In 2015, w e were all packed up after we gave the first presentation when we got word that we were needed to fill a bit more time. Eagerly we ran to the closing ceremony location, where we talked in front of about 3000 people! Along with showing our robot some more, we called Swartdog alumni up to the stage to talk about their experiences on the team. Sturgis Falls is an annual week-long celebration in our community. Each year we are contacted to bring our robot to excite children about the robotics programs Cedar Falls Schools have to offer. Since the festival’s start in 2013, we have participated in the festival with the goal of showing people what opportunities are available within the Cedar Valley for people to get involved with FIRST. Along with other FRC teams, we demonstrated our robot and showed what FRC is. As awareness of STEM activities increase, cities in our area have STEM festivals or STEM nights with participants from various school showcasing STEM activities. FIRST Team 525 proudly participates at these events demonstrating our robot and giving guests opportunities to drive smaller robots that our team has built for outreach activities. 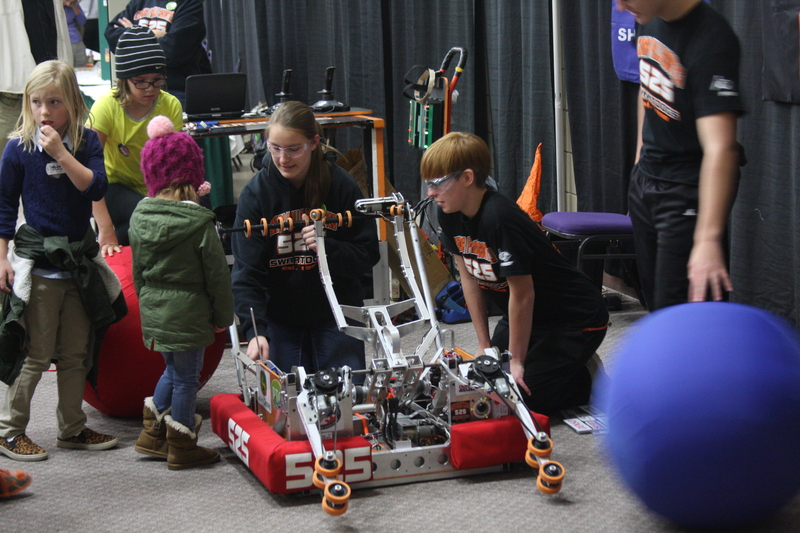 Students are given the opportunity to explain FIRST robotics and what it means to them. The Cedar Falls Historical Society invited us to create a display as part of their “A Useful Tool: Invention in Cedar Falls” exhibit. Through this invitation, we created a display featuring our 2016 robot that explains not only our robot but also FRC. The exhibit was on display November and December 2016. In September 2016, we were invited to participate in a show focusing on FIRST teams within the Cedar Valley on the Cedar Falls tv. program called Hotline. The show featured FLL and FTC teams in addition to our team. Team members and mentors explained the opportunities that FLL, FTC, and FRC offers its members and what students gain from being on a FIRST team. Along with several other STEM related school clubs, we took part in the STEM Open House at the High School on January 12th. This event also showcases the accomplishments of students in Project Lead The Way classes at our school. Many high school teachers, students, and their families attended this event. Senior executives from John Deere invited our team along with two FTC teams to the Waterloo Tractor Cab Assembly Operations. We were asked to give a presentation to John Deere employees about FIRST and volunteer opportunities. After the presentation we were given a tour of the assembly floor and assembly robots. We were also asked to give presentations to John Deere employees over the summer to inform them about mentoring, upcoming seasons, and volunteering opportunities. In February 2017, we visited John Deere again during to demonstrate our robot and talk to John Deere employees about FIRST.